Has anyone used 45 Cal .452 300 gr XTP® Mag in there Muzzleloader for ELK? Sorry, joda. I unable to help. The only question I had when I looked into this large caliber pistol bullet was will it have enough penetration for an animal as large as an elk? 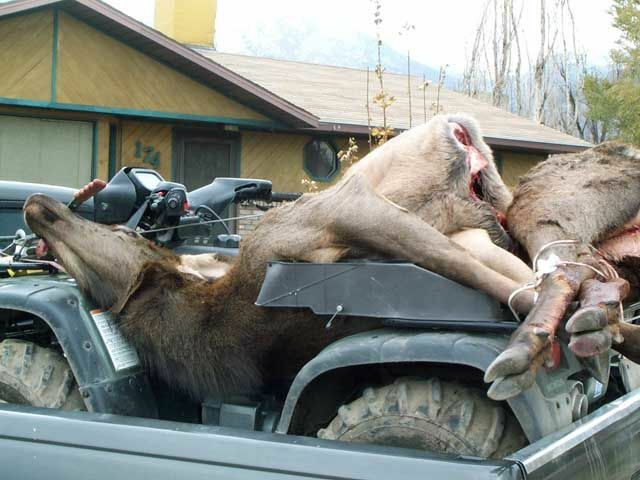 no problem, I have seen articles of people using them for deer alot but not on Elk other than one or 2 statements. It is the Mag bullet instead of the normal xtp? From what i have seen there is no real difference between a muzzleloader bullet and a pistol bullet. I just dont want the bullet blowing up and losing the animal. I was thinking of it as a back up to my barnes 300 ez-expander. It is alot cheaper to shoot than the barnes bullet... I have a late December hunt for cow elk in AZ. I have a lot of Elk and a lot of snow the last 2 years i have gone. joda, if you are looking for something inexpensive to shoot, have you looked at laser cast bullets? They make a 300gr .452 one. I use their 405gr bullets for my .45-70. I believe the 300gr one would be good for hunting. The blunt nose bullets do well at creating a wound channel and don't break up so get good penetration. They won't have near as good a trajectory as the Barnes though. Also, don't they make sabots for .50-cals that will accommodate .45-70 (.458) bullets. They should be cheap and a plenty. From what i have seen there is no real difference between a muzzleloader bullet and a pistol bullet. The mag bullet was designed to operate at a greater velocity range therefore the expansion characteristics differ. ok, they are the same velocity ranges normally unless you are using 777 or blackthorn 209. The red lines represent where the bullet is designed to expand. As you can see the non mag bullets shouldn't be used in applications where the impact velocity is above 1700fps. thanks i saw that. I also saw on a few other Muzzlerload pages that poeple have been using them out beyond that. What I was kind of getting at is that 45 Cal .452 300 gr XTP® Mag operational window and a Muzzleloader bullet window are the same for the most part. Great pistol bullets are for the most part great muzzlerload bullets. I have used the 300grn .429" Hornady XTP bullet for elk out of my .50 cal Remington 700ML. They work fantastic! Zero recovered, all went in one side and out the other. Elk are BIG critters and can pack the lead. The cow I shot with the above mentioned bullet. First hit was through the boiler room at 100 yards, it went 20 yards and went down. When I got over to it, it jumped up 30 yards away on wobbly legs and I put a 2nd one through the boiler room. She continued stumbling through the oak brush. I quickly reloaded and put a final round through her neck. AMAZING she went as far as she did with 2 huge holes through the engine room. Thats the way elk are though. I shoot 120grns Pyrodex RS with the 300grn XTP. For deer I use the 240grn XTP over 90grns RS.